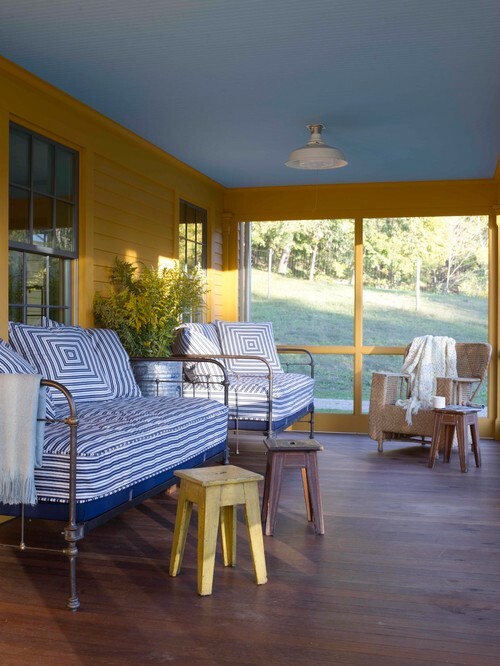 Who Doesn’t Want a Summer Sleeping Porch? It’s been a little warmer than normal the last couple days and although I don’t like to turn the air conditioning on this early in the year, I admit I’ve had to. Last night I was dreaming of how nice it would be to have my very own sleeping porch during the summer months to enjoy the evening breezes while dozing. A screened sleeping porch of course, so I don’t have to deal with mosquitoes and creepy crawlers! This cottage style sleeping porch reminds me of the one at Mrs. Ashby’s house in Geneva that I used to clean when I was 15 years old. Her home was the start of my love affair with old and charming houses. Doesn’t this summer sleeping porch look like something at grandma’s house? What grand kid wouldn’t love hanging out at grandma’s and sleeping on this porch with their cousins? 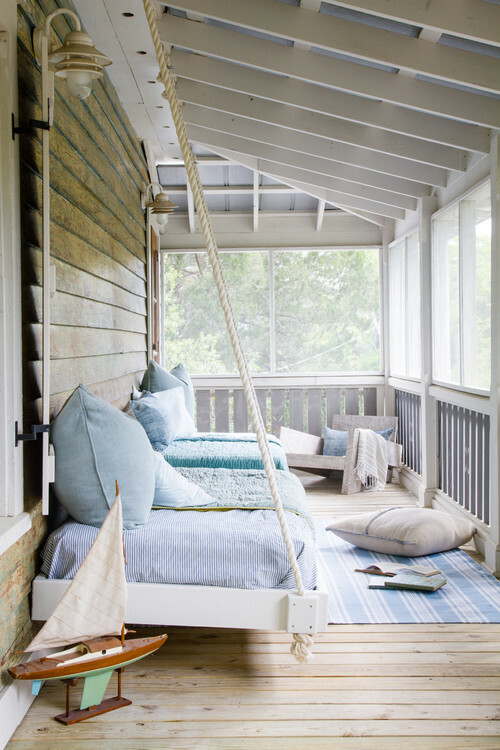 Here’s a sleeping porch that serves double duty as a lounge area. The bed at left is also a couch by day. 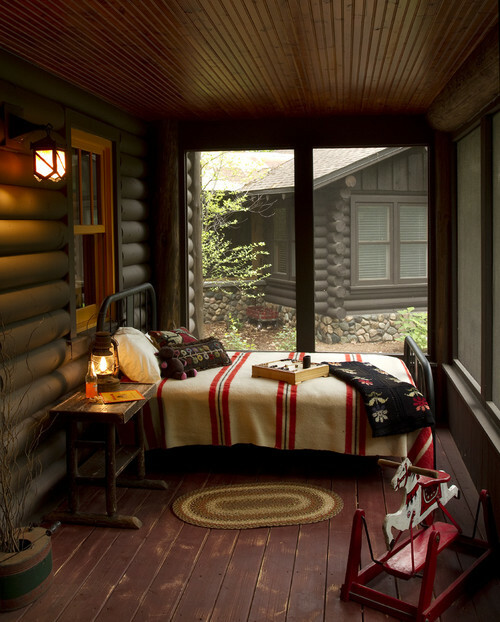 A rustic cabin type porch is perfect for sleeping during the cooler months of fall. 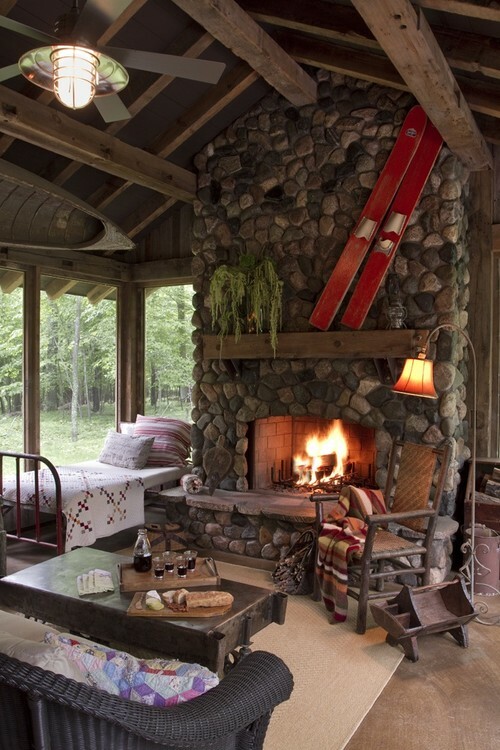 A big stone fireplace can keep things toasty warm if the temperatures drop. And look … wine, bread, cheese, and fruit are ready and waiting! This light and airy porch would be so much fun for a girl’s retreat with your best friends. 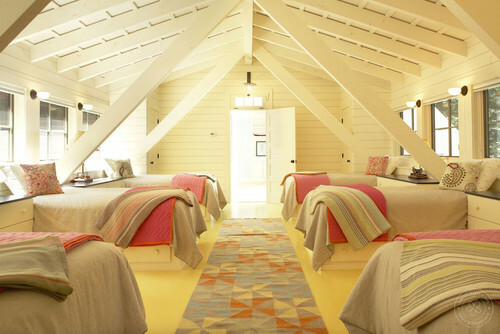 A coastal sleeping porch has whimsical beds that appear suspended by ropes. 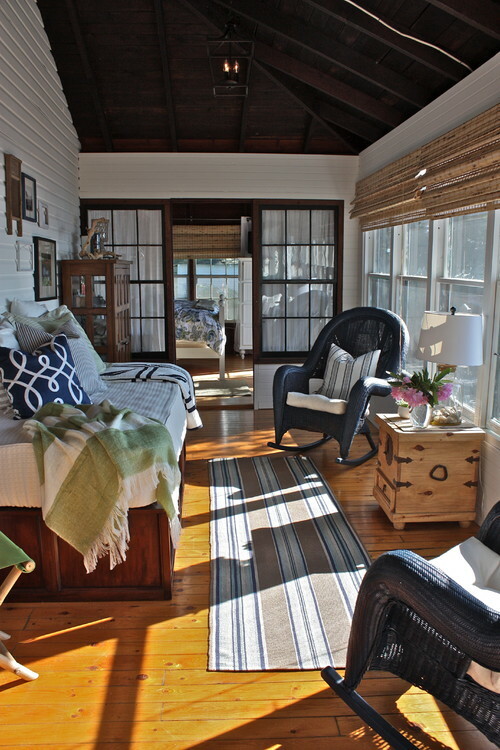 A cozy bed at the end of this screened porch is the perfect place for reading or napping. 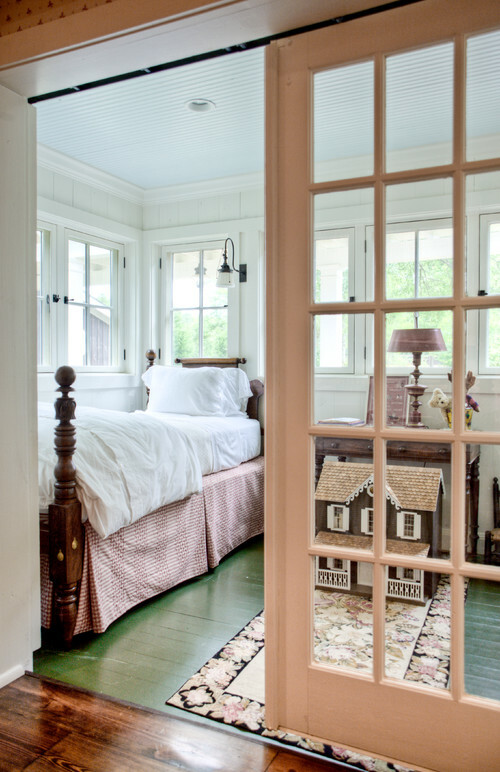 A larger bed just fits in this sleeping porch. Note the sconce lights for nighttime reading. 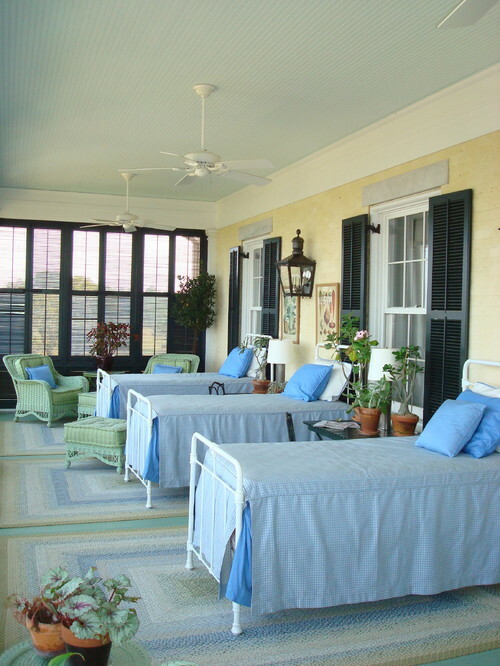 Plush mattresses provide sleeping comfort in this cheery screened porch. 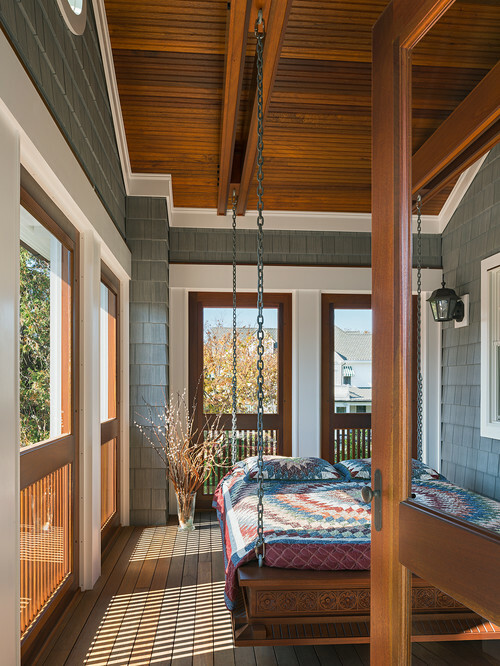 How about a suspended bed in a charming porch? I love to sleep in open air as often as possible. Mostly this means sleeping with the windows open. I think the fresh air is good for the heart and soul! I love all these, too. Our air has been on for a month already. I’d be happy to just have a roof over my porch 😉 I’m still running my heater every morning. Thanks for these great porch images! We’ve been planning to screen in a portion of our porch so we can sleep out there on hot summer nights! My grandparents had a sleeping porch upstairs and I have fond memories of sleeping and playing in there as a small child. I need to screen in my porch and throw a bed out there. Those sleeping porches are AMAZING. I love the first one! Pinned! They are all beautiful but my favorite is the Traditional Kids, love the green and white. Thank you for offering me some inspiration! 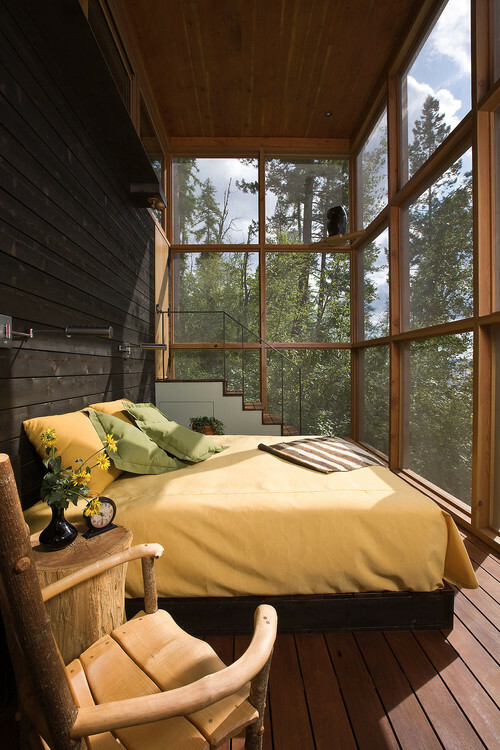 I would love a sleeping porch! As long as nobody was able to see me…I’d be quite a sight snoozing away, probably with my mouth open:) Thank you so much for stopping by my blog! The Dodgers no longer train in Vero Beach, they moved to AZ for spring training but trained in Dodgertown from 1948 to 2008! This gives me all kinds of inspiration. Thanks for posting this. We’ve talked about screening in our front porch for just that purpose. It would be heavenly to sleep outside all summer long. mmm especially if it’s raining and there’s a tin roof! Lovely inspiration shots, happy Friday! They are all so dang charming. I think I’m sold on the hanging bed. I’ve been dreaming of one for a while now. I have the perfect back porch for it, but it means sacrificing most of my porch furniture and I’m not ready to do that. I guess I could just hang my bedroom bed? I think any of those would suit me for different occasions. I thought about how much fun it would be for the grand kids to have a porch if their own for spend the nights with BobBon when they get older. Love these! I am planning on adding one in our “old” (looking) farmhouse we are planning to build. But I am confused about the practicalities. Do you need indoor-outdoor furniture and bedding? Would a regular mattress get moldy? Any info would be most appreciated! I grew up hearing about my mother’s sleeping porch. I was jealous then, aND I still am. My favorites are No. 1 and the girls sleepover room. My girlfriend had an open back porch, upstairs, and we spent many a summer night on sleeping bags out there. Could i really ask for More than anything like this .